There’s just so much to see and do whilst holidaying on Dartmoor, it’s simply impossible to cram it all in. 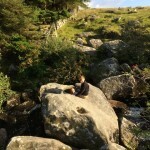 To help get the best out of your stay at our Dartmoor Holiday Home we’ve compiled a list of 10 things we think are “must do’s” from our own holiday experiences at Three Pound Cottage. They’re in no particular order of preference, we’ve just started with the local ones first. 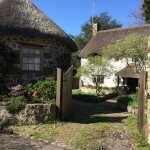 Take the short stroll past the holiday cottage and cricket field to Wreyland to see the amazing thatched historic properties. If you have a few more minutes to spare, take the bridle path on the right to walk down to the stream. Take a little detour up the open field on your right to get a great view of Lustleigh and a lovely perspective of Wreyland. 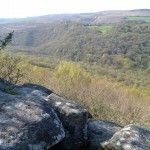 The walk along the ustleigh Cleave towards Hunter’s Tor gives spectacular views with the added bonus of building an appetite for the next “do” on the list. 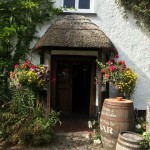 The village pub “The Cleave” serves fantastic food and should not be missed. The only downside is you may find yourself dining there almost every night! Certainly when we stay, the kitchen hardly gets used. 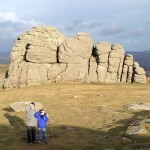 Haytor is the most iconic Dartmoor Tor and is only 5 miles from the holiday cottage. A holiday on Dartmoor just wouldn’t be complete without a visit to Haytor. 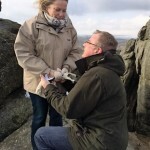 In fact it has become such a special place for us – I proposed at the top of Haytor (and in case you’re wondering, she said ‘yes’). 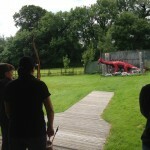 We first heard of Dragon Archery from one of our guests. 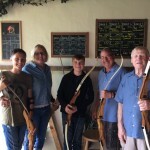 Quite simply, it is archery made fun for all the family and is well worth the one hour drive from the holiday cottage. Be warned, it is addictive – we go at least once, every time we holiday at the cottage. Much to our amazement our 12 year old became a ‘dragon slayer’ recently which has given him bragging rights. 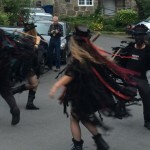 Morris Dancing like you’ve never seen and Folk Music like you’ve never heard. Beltane are the new Rock’n’Roll and must be seen. 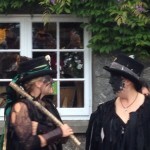 Check out when and where on Dartmoor they’re doing their thing, go along and have an awesome evening. Drive to Batworthy Corner, walk towards Scorhill, cross the clapper bridge and on your right, on the river bank you’ll find the mystical Tolmen Stone. A large granite boulder with a hole through it’s centre created by water erosion. Dartmoor folklore says that passing through the Tolmen Stone will heal ailments such as arthritis, back pains etc as well as aiding fertility. There are plenty of locals who give testament to this. After passing through the stone, with all aches cured, it is but a short onward walk to the stone circle at Scorhill often referred to as the Stonehenge of Dartmoor. 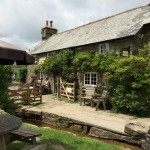 The Rugglestone Inn, on the outskirts of Widecombe in the Moor, recently came second in the Countryfile Magazine awards for best country pub. It has a beautiful beer garden, perfect for lunching ‘al fresco’ on a sunny day, whereas the rustic bar is snug, quaint and cosy. 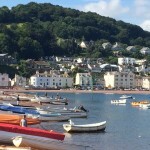 Shaldon is a charming coastal village with so much to offer including a long beach, a secret smugglers cove (Ness Cove) and a tiny zoo. There are plenty of places to drink and eat along the beach with a scattering of pretty independent shops and Georgian architecture to admire. Shaldon’s thriving community hasn’t succumbed to tourism in the same way as other seaside towns. Amusingly it has been described as ‘a quaint English drinking village with a fishing problem’ but don’t let that put you off, it’s great day out by the sea and only a 30 minute drive from our holiday cottage. Inspired by Devon Hampers, we challenge you to enjoy a picnic cream tea on Dartmoor, or further afield. All we ask is for you to either send us a photo or post it on our facebook page. To make it easy for you we’ll even provide the Cream Tea in your welcome pack. Let some of our previous guests give you inspiration.